Nearly 26,000 refugees entered the U.S. from October to December 2016, close to the quarterly average number of refugees needed to meet the Obama administration’s target of 110,000 refugee admissions in fiscal year 2017, according to data from the U.S. State Department’s Refugee Processing Center. The 2017 annual ceiling – the highest since 1995 – is significantly higher than last year’s ceiling of 85,000 refugee admissions. Administration officials said they wanted to increase refugee admissions to the U.S. due to the growing number of people displaced by conflicts around the world. 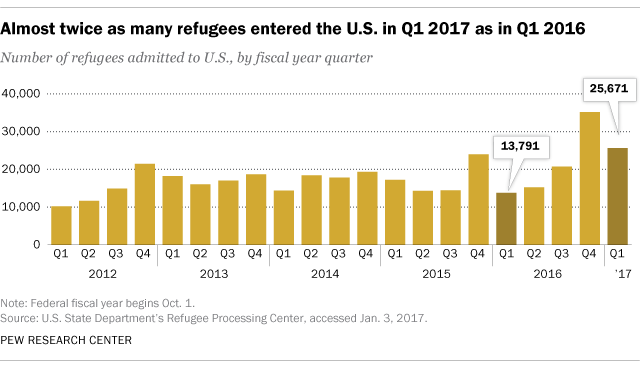 In the first quarter of fiscal 2017 (October to December 2016), almost twice as many refugees have entered the U.S. as in the first quarter of the year before, when nearly 14,000 refugees entered the country. Quarterly refugee admissions fluctuated under the Obama administration, spiking in the fourth quarter in some years and holding steady across all four quarters in others. Despite this, the annual ceiling for refugee admissions was reached in each of the past four years (previous administrations often admitted far fewer refugees than were planned for). For instance, in fiscal 2016 – a year in which the annual ceiling was reached – the fourth quarter (July to September) had the highest number of refugee admissions in a single quarter since at least 2001. The policies of the incoming Trump administration may affect the flow of refugees into the U.S. President-elect Donald Trump has said he backs “extreme vetting” and an ideological screening test for people entering the U.S. from countries like Syria and Iraq where the Islamic militant group ISIS is known to operate. Depending on what, if any, actions are taken to vet asylum seekers, the volume of refugees accepted from certain countries may lag behind the numbers admitted by the Obama administration. In the case of Syria, the Obama administration granted legal residence to 12,587 refugees in fiscal 2016 – more than 20% above the number originally targeted. Refugees are people who have crossed international borders to receive protection from persecution, war or violence, according to the United Nations High Commissioner on Refugees. They constitute a small share of migrants approved to live permanently in the U.S. For example, in fiscal 2015, refugees accounted for 11% of all immigrants receiving lawful permanent residence (a “green card”). Several U.S. government agencies process refugee applications and conduct interviews before granting approval for an applicant to enter the country. The entire application process can take up to 24 months. The origins of refugees entering the U.S. have shifted in recent years, away from Europe and toward Africa, the Middle East and Asia. Once admitted to the U.S., refugees are resettled by nine voluntary agencies that partner with the U.S. government’s Office of Refugee Resettlement. In fiscal 2016, just 10 states received more than half of refugees entering the U.S. The origins and religion of refugees entering the U.S. so far this fiscal year are largely similar to those in fiscal 2016. The top countries of origin are the Democratic Republic of the Congo (20%), Iraq (14%), Syria (14%) and Somalia (14%). Nearly half (46%) are Muslim while 44% are Christian – a similar composition to fiscal 2016, when the U.S. admitted a record number of Muslim refugees.